A look at four projects created by central Maine "makers." 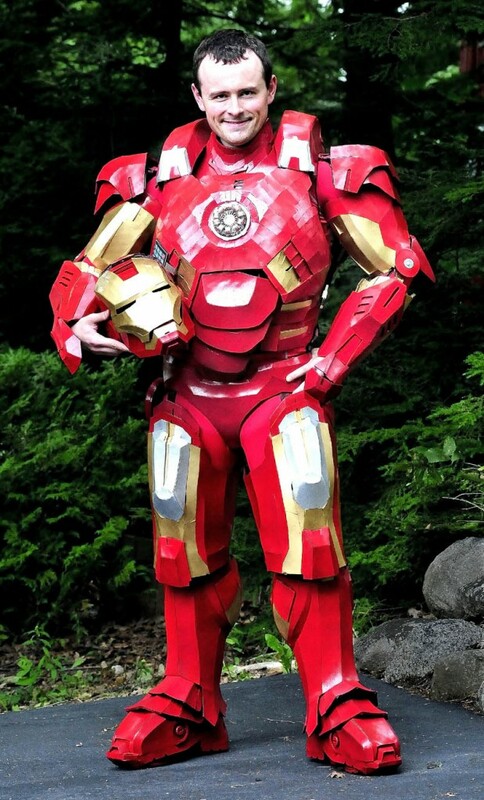 Lemieux has spent more than $2,000 and 500 hours creating a wearable costume out of foam rubber that is laced with electronics. The components allow him to trigger visual and sound effects that emulate the popular movie character. Other projects: There are still more modifications Lemieux is considering for his suit, including a movable robotic “cannon” mounted on the shoulder, a battery-charged sensor that would announce when his power levels fell beneath a certain level, or a video monitor that would improve his ability to see from within the helmet. 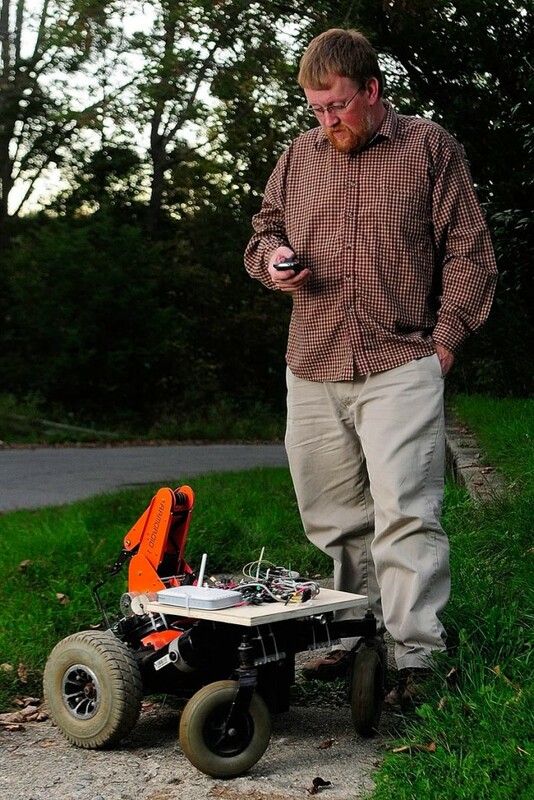 Fowler controls his robot, powered by a motor from an electric wheelchair, with his cellphone. He hopes to add a robotic arm, currently sitting on a lab bench in his home, to the top, which he will be able to control in the same way. “It will be like a mini moon rover,” he said. The wheelchair motor is sturdy and has a good battery, he said, allowing him to cart around hundreds of pounds on the robot. The battery has to be recharged after about 90 minutes of activity. Other projects: Fowler has built a home security system using motion sensors and microcontrollers. Schott knits her creations on an unusual knitting machine, an old Singer 360 model, no longer produced by the iconic company. The machine, which looks like an elongated typewriter filled with knitting needles, allows her to make a sweater in a single day, or as many as four hats in an hour. It doesn’t use electricity. To operate it, she moves a carriage back and forth, while the yarn feeds into the machine from above her head. Other projects: Schott said she enjoys learning new skills, most of which, like canning, are related to self-sufficiency. She said she would like to tackle learning car repair next. 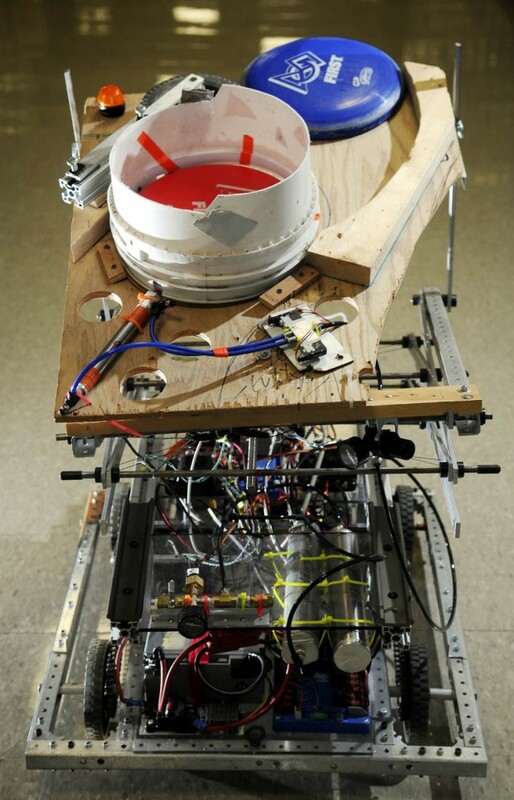 The 4-foot robot, which collects plate-sized plastic disks from the floor and shoots them at a target, was built by the student robotics club. It can be piloted around the floor using a wireless remote control equipped with a joystick and was built to be part of a three-on-three contest in which the discs are shot at different targets, sometimes against defenders, for points. Other projects: The team’s individual members have their own projects on the side, but their next robot-building challenge as a team will soon be announced by FIRST Robotics, an international group that organizes high school robot competitions.